Action Comics #1007 review: Leviathan Rising – AiPT! A.R.G.U.S. Kobra. D.E.O. Checkmate. Spyral. The DC Universe is chock full of massive organizations, both good and bad, with special agendas. Most operate in a covert manner, with agents buried everywhere. But a sinister new force is threatening all of them. And so begins the all new and exciting arc of Action Comics, the second story arc by Brian Michael Bendis on the title and for this espionage epic, he’s joined by the master of spy and crime storytelling, Steve Epting. We pick up with Jimmy Olsen, who, as teased previously, has been looking into the various organizations of the DCU. Riding with a seemingly new girlfriend, Ella, Jimmy finds himself in a Kobra gathering. Exclaiming in surprise that Ella is a lizard person, Jimmy resists rather than partake in the Kobra rally. Epting excels at framing and character expressions, as one would expect and every little moment or interaction or a double page spread of Kobra cult are presented with great flair. Colorist Brad Anderson is an excellent match for Epting as the lighting and color are carefully managed across every scene to fit the nature of the espionage narrative whilst also not undercutting the bright spectacle one comes to expect from a Superman-centric story. The epic sequences, always framed with great dynamism, always work throughout the issue. Letterer Josh Reed is also a key component here, giving each scene a sort of texture and helping get across the characters’ experience and state through lettering choices alone. The above spread and others that follow are a fitting example as Reed fills every panel with the loud chants of ‘Faith to kali yuga!’ and induces an almost claustrophobic sensation which affects the reader, perfectly encapsulating Jimmy’s own struggle and state as he’s surrounded by a wild crowd of snake lunatics. Once Jimmy actually manages to flee, sheer moments after he runs out of the Kobra premises, with Ella and others right behind him, the entire place is swallowed up in gigantic blue energy. Instantly all that the energy surrounds vanishes without a trace. Epting and Anderson really come through here, capturing the absolute emptiness that remains after the event in a beautiful splash image. And thus begins the mystery at the heart of this arc. Bendis and Epting’s Jimmy is worth discussing here, as they play him as an incredibly competent and skilled journalist who almost just happens to run into these outrageous situations. There’s almost a bit of Tintin in him here, in that sense. He’s still the awkward, mild-mannered Jimmy we know, but there’s a lot more to this Olsen than just that. It’s a lovely balance of past incarnations of the character, with Jimmy being played completely straight in out there scenarios. From there we move to Lois Lane’s meeting with Sam Lane, which makes up the bulk of the issue. Serving as the emotional backbone of the issue, it sees Lois discuss the complicated nature of her relationship with her father and how she hopes to move forward. And thus, in doing so, she reveals to him in confidence that Superman is the man she loves and he’s also the father of her child, Jon Kent. Expressing her greatest truth, she hopes to find some measure of reconciliation with her father, only for him to walk away shocked and disappointed. It’s a sad, heartbreaking moment as an attempt to mend bridges with truth only breaks things apart further. Then we cut to Superman in Atlanta, where a lady in the distance yells for out from him as she falls from a building. Reaching her just in time (in a striking page showcasing his movement) Superman finds that the woman he’s saved is none other than Amanda Waller. Revealing that whoever ambushed her had to have top secret information, she points Superman upwards. But the moment he flies up to act, the blue energy emerges once more to swallow everything. First Kobra, now A.R.G.U.S. Superman heads down to speak to Amanda, but finds her gone, just like the building above. And so we conclude. Strange things are afoot across the DC Universe. As Lois Lane struggles with her own truth and how best to express it, whilst paying the price for doing so, Superman and Jimmy must discover another truth, one that plagues the entirety of the DC espionage world. 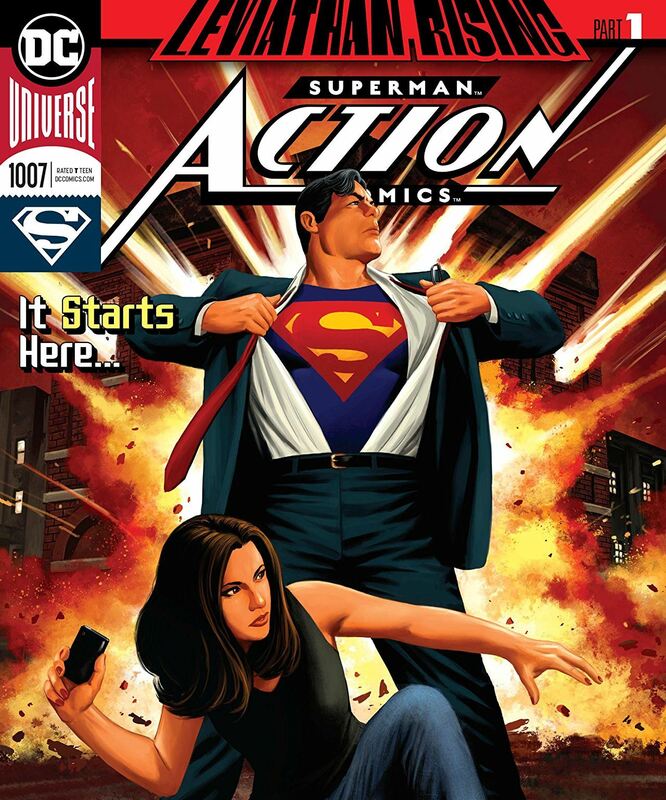 Action Comics #1007 is a solid kick off that’s not only accessible but inviting and intriguing with its teases. Leviathan, the organization created by the legendary Grant Morrison and David Finch during the Bat-epic of the 2000’s seems to be making big moves. And yet, all is not as it seems, as the seeds of mystery have been firmly planted. Jimmy, Lois and Clark have a lot of work to do and with a global threat against them, stakes are higher than ever. This is the first step building towards the much-teased and anticipated Bendis and Maleev Leviathan story that’s set to strike soon. If you wish to know where the DC Universe is headed, this is where you jump on.